The roller coaster of life that we ride on assures us that sooner or later, we'll encounter some problems. To solve them, we can either deal with them ourselves, or we can just hire someone to make it all go away. Two anime series -- the '80s classic "City Hunter" and the more contemporary "GetBackers" -- take different approaches to the "heroes for hire" concept. One features a hero with uncanny natural skills; the other, a group of people with superhuman powers. Both are entertaining in their own way. Ryo Saeba is either the coolest hero for hire ever or the most perverted womanizer to ever walk the face of the Earth. In the first "City Hunter" anime series, he switches between both personas literally in the blink of an eye. This comes much to the chagrin of the female clients who employ him in his role as a "sweeper," a man whose mission is to sweep crime off the streets of Shinjuku. His favorite word to use to describe women and various parts of their bodies is "mokkori," which means ... well, the real meaning can't be revealed in a family publication. Let's just say it implies "very nice" in a very naughty way and leave it at that. But when he has to get serious about his work, he's good. Very good. Good enough, in fact, to be able to shoot off the belt buckle of a man standing several yards away as busy pedestrian traffic passes by. He also has a sixth sense about danger, being able to detect when something will happen before it happens. While most of the episodes serve as stand-alone stories, there are common threads that run through them that are helpful to note. Kaori Makimura, for instance, is the adopted sister of Ryo's former partner and friend, Hideyuki. While she believes she is Hideyuki's natural sister, he reveals to Ryo the secret behind her family ties -- conveniently before Hideyuki is gunned down in the fifth episode. There are also people from Ryo's past -- Umebozu, a former sweeper, and Saeko Nogami, a Metropolitan Police detective "and the only woman I ever loved," according to Ryo -- who pop up as well. Forget political correctness here -- most episodes start off with Ryo fawning over his latest client and end with his client fawning over him. The great equalizer in all this is Kaori, his female partner in the two-person City Hunter group who usually keeps him in line in comedic fashion by bonking him with a giant hammer that she seems to pull out of nowhere. It's all goofy fun that holds up remarkably well close to 20 years after it originally aired in Japan. 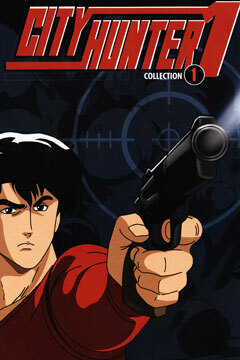 The "City Hunter" anime continues through three other series, several specials and a movie, available stateside through ADV; rights to the manga on which the anime was based belonged to Gutsoon Entertainment's Raijin Comics imprint, which released five volumes before going bankrupt. The manga follows the anime series closely, although it is a bit more graphic in showing just what "mokkori" means. Elsewhere in Shinjuku (but in a completely unrelated series), Ban Midou and Ginji Amano bring a high-energy twist to the "heroes for hire" formula. As partners in GetBackers, a group that boasts up to a 100 percent recovery rate in getting back items lost or stolen from their clients, the duo employs a wide range of otherworldly skills to accomplish their tasks. Ban is the master of the Jagan, a technique that allows him to project an illusion into someone's mind for one minute when he makes eye contact with him or her. He also has superhuman strength, which he uses in a powerful grip known as the Snakebite. Ginji can channel the power of electricity to attack or defend against his opponents. With such powerful heroes at the center of the series, the challenges they face must be formidable as well. Recovering anything, whether it's a stolen cell phone charm with sentimental value or an expensive Stradivarius violin, becomes a struggle, with the criminals often employing super-powered agents of their own. At the core of all of this is the mystery of the complex known alternately in English translations as the Limitless Fortress or Infinity Fortress. 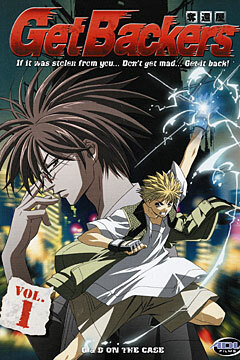 Ginji in particular is confronted with his past leadership of VOLTS, a gang that brought peace to the chaos of one of the complex's communities until he stepped down as its leader, and a shadowy conspiracy that takes the series beyond its "get back whatever is lost" roots. Unlike many of the situations in "City Hunter," only a small percentage of the stories of "GetBackers" can be neatly packaged in one episode, with multi-episode arcs the norm. Even the stand-alone episodes can't escape completely from the influence of the complex web of background stories that fuels the series, so this is one series that begs to be watched straight through from beginning to end. Anyone who enjoys the anime, now available in 10 DVD volumes from ADV Films, will want to pick up the manga as well. As with all manga-to-anime adaptations, there is some duplication with the stories. But because the manga was nowhere near completion while the 49-episode anime was in production -- the manga was only 14 volumes into its now-37-volume run in Japan -- the anime came up with its own ending. Tokyopop's domestic release has just begun to mine this new material, with volume 16 recently released and volume 17 due in February.